Finger tophi don’t always hurt, but they do stop you gripping. Even painless tophi make life difficult when your fingers are affected. 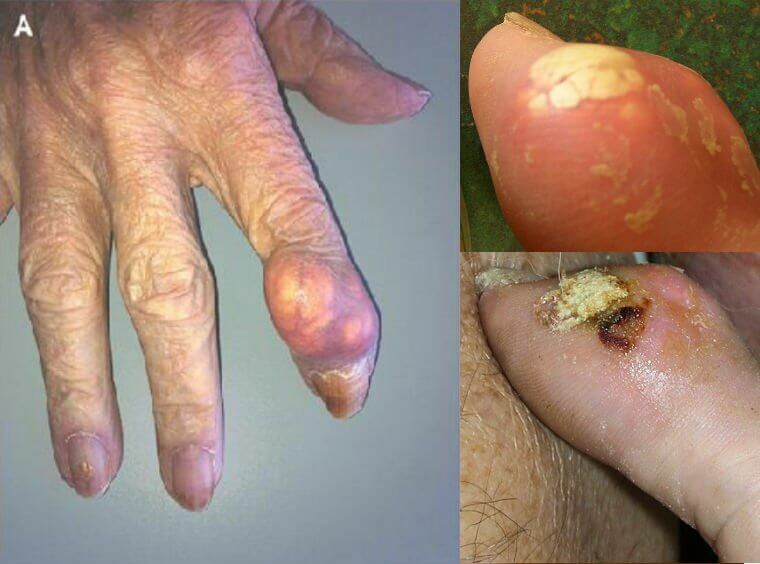 These finger tophi photographs show what happens when tophaceous gout hits your fingers. Like toes and ears, fingers are subject to lower temperatures, so these extremities are common targets for tophi. A tophus, the singular of tophi, can form in any soft tissue when you have gout. This page covers gout in and around the finger joints. It is difficult to say if this is a grouping of several tophi, or a single tophus. It doesn’t really matter, if you have several lumps or one big one, you can be certain that you need to get treatment fast. Early uric acid lowering treatment at maximum dose will ensure that tophi shrink as fast as possible. This can often avoid lancing or other surgical procedures, and dose can be relaxed after a year or so to maintain uric acid at a safe level of 5mg/dL (0.30 mmol/L). I cannot imagine how difficult it must be to perform everyday tasks with tophi on the fingers. I have experienced swollen joints in my wrist, fingers, and hand, and I know how difficult that made life for me. Best to get your acute gout fixed before it gets tophaceous, so head over to the Gout Treatment department and get your uric acid safe. If tophi are left to grow, they make treatment for gout more difficult and more invasive. This gouty tophi in the finger bone report shows how tophaceous gout can spread throughout the body. Stay safe from uric acid crystals and keep your levels low. Have you had a finger lost to gout? Don’t dismiss gouty fingers. Untreated gout leads to bone destroying tophi. See how to avoid losing your fingers to gout. I will add to this list as new pictures of tophi on the fingers become available. I am always on the lookout for interesting gout pictures. Do you have photographs of tophi or other gout-related images, please share your gout pictures. [image nofollow after insert]To read the document change history, click the GoutPal History image on the right. Do you have suggestions for improving Finger Tophi? Then, please add your idea to GoutPal’s Suggestion Box. Or, send the Feedback Form, below.